Are those onions in your pantyhose? So today is day 2 of my IUI. Besides minor cramps and bloating, I feel great. I am so glad I took Letrozole as opposed to Clomid for this cycle. I think Clomid is a great drug that works for many people but not me. It also makes me feel crappy even for weeks after I take it. Hopefully, insurance companies will soon accept Letrozole for use as a fertility drug and not just a drug to fight breast cancer (it can be difficult to get some insurance companies to approve it sometimes). One of my primary health goals is to cut out processed food. I still have a ways to go but I have made a ton of progress. One thing I struggle with is finding the best way to store and preserve my food since unprocessed food tends to go bad quickly. I recently found a great food hack that suggested storing onions in pantyhose. My husband was a little confused when he saw this and asked me why on earth I would store onions in pantyhose. While it is strange, it really works and does extend shelf life! Today I decided to create a pintrest account so I can share and organize the recipes, tips, and information I have found that have helped me make healthy changes. I also added a pintrest follow button on my blog (I feel so technologically savvy!) and you can also find it here. Feel free to browse, follow, give suggestions, or share information you have found useful. For those of you not familiar with my story, my husband and I decided in December to resume fertility treatments in May. In January, I decided I would do everything possible to improve my physical, mental, emotional health. I have worked hard and have made some significant changes. Things were going great until a few weeks ago. I have kept many of my good habits (no soda, artificial sweetener, limited added sweeteners, etc). Even so, I have let a lot of things slide. I’ve been cooking less and relying more on quick meals which are more likely to be processed. I have also not been to the gym as much and when I go, I have been focusing mainly on cardio (I know that it does not do me much good unless I balance it with strength and flexibility training). Last week I went home to spend time with my parents. It is crazy to think that when I was a teenager, I could not wait to leave home and now that I am adult, I wish I could spend more time there! While at home, we made whole pumpkin spelt muffins (which are addictive beware!). We had some leftover pumpkin purée which we used a few days later to make pumpkin pancakes (I used pumpkin spice mix instead of nutmeg). These were also delicious and idiot proof to make which I often need. I am not under any delusion that pancakes are healthy but who really wants to live in a world without pancakes? I decided to look into the ingredients and see if there was any room to make healthy changes. Please note that food pictures and nutrition information are from Fooducate.com (one of my favorite websites!). 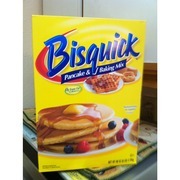 In the past, we used to use Bisquick Pancake & Baking Mix. Here is a list of the ingredients: enriched flour bleached (wheat flour, niacin, iron, thiamin mononitrate, riboflavin, folic acid), corn starch, dextrose, partially hydrogenated soybean and/or cottonseed oil, leavening (baking soda, sodium aluminum phosphate, monocalcium phosphate), canola oil, salt, sugar, datem, distilled monoglycerides. contains wheat ingredients. 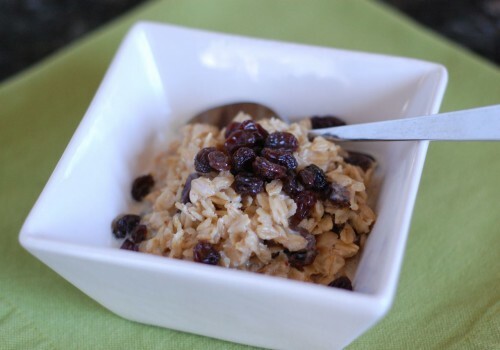 If ingredients are not your concern, it is easy (and cheaper) to make a Bisquick equivalent at home (see recipe here from another great blog). I also like to top my pancake with cinnamon and a little bit of butter. 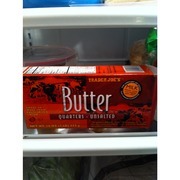 At the grocery store, there seems to be countless varieties of butter and margarine to choose from. Ingredients: Liquid Soybean Oil, Partially Hydrogenated Soybean Oil, Whey, Salt, Vegetable Mono- and Diglycerides and Soy Lecithin (Emulsifiers), Sodium Benzoate (to Preserve Freshness), Natural and Artificial Flavor, Vitamin A Palmitate, Colored with Beta Carotene (Source of Vitamin A), Vitamin D3. 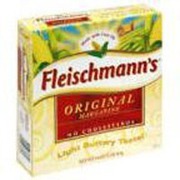 The Mayo Clinic says that compared to butter, margarine is healthier because it does not contain cholesterol. This is a valid point for consideration. My health goal, however, is to try my best to stay away from processed foods. This does not look good. 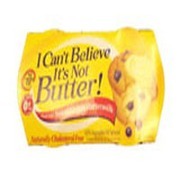 I decided to look into actual real butter. 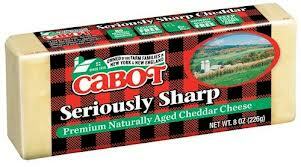 This product is high in saturated fat so should be consumed sparingly. For me, though, I prefer to consume the real thing on a rare occasions compared to processed alternatives. I have also found good substitutes for butter. 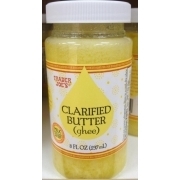 So ghee is technically a class of clarified butters (read about it here) but for my purposes, I use the terms interchangeably. I LOVE this stuff. It is also shelf stable and lasts a really long time unrefrigerated. You can actually even make ghee at home. I have not yet done so but I did find a recipe that I think I could handle without messing things up too bad. Also, for your viewing pleasure, I included a picture from the same site of the part of butter that is removed when making ghee. Happy Pi day everyone! I am a self professed math freak so geeky stuff like this brings me joy. I usually celebrate this occasion by baking a pi pie (I did not create the pie pictured in this post but you can click on it to see its origin). This got me thinking about one of my nutrition/fertility goals which is to cut down on sugar. First I would like to give an update on one of my previous posts that discussed my decision to give up all artificial sugar and soda. This was a hard one but I am so glad I did it. 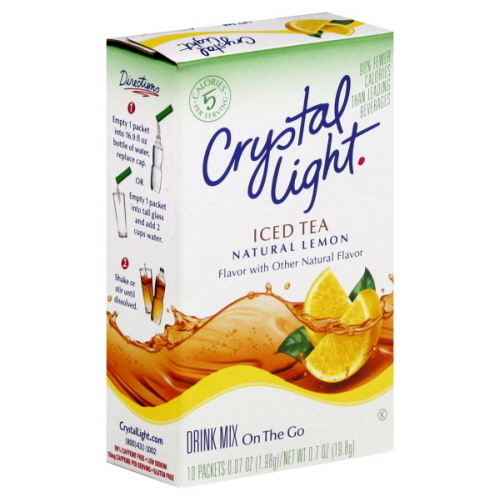 I had given up soda before but always craved it and I think it was because I was still consuming other sources of artificial sweetener such as Crystal Light. 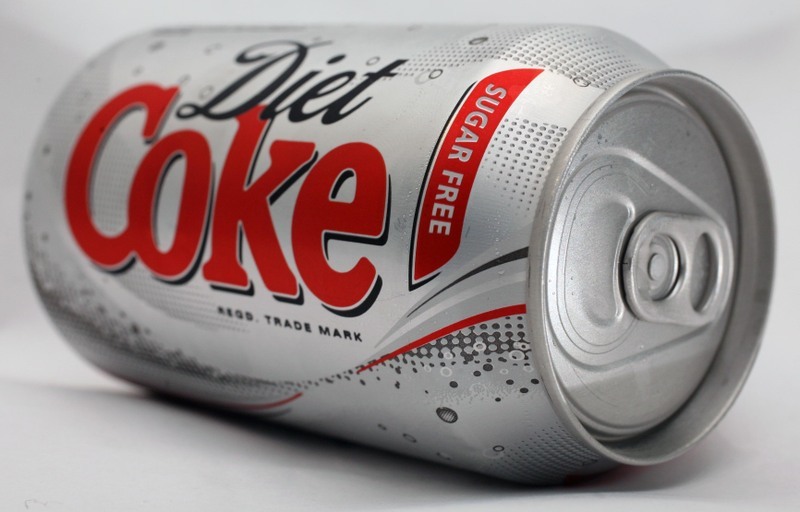 Giving both artificial sweetener and soda did cause me to go through some unpleasant withdraw symptoms such as headaches and moodiness (I had actually started this process before my previous post). I am thrilled to say that not only have I given both up but I do not crave them like I used to. I never thought I would say this but now I actually crave water. I did drink water in the past when I also drank soda but I would just do so since it is healthy. A few days ago I went out to eat with some friends who ordered soda and I did not have any urge to order one which still feels kind of crazy. Now I am focused on cutting down on sugar. Initially, I had no idea how much sugar one person should have in a day so I did some research. Numbers do vary of course, but the USDA recommends that women on a 1600 calorie diet limit intake to 24 grams of added sugar. This does not include naturally occurring sugar in foods such as fruit. I know it is important to also monitor your intake of naturally occurring sugar but in this post I am focusing on added sugar. There are some foods and drinks that I expect to have high levels of sugar. For example, a can of Coke has 33 grams, a Krispy Kreme doughnut has 10 grams, and a regular sized snickers bar has 30 grams of sugar (I obtain my nutrition information from Fooducate). In other foods, sugar is much sneakier. A 10 oz glass of Tropicana orange juice has 28 grams, a carton of Yoplait original low fat strawberry yogurt has 26 grams, and a serving of Prego pasta sauce has 10 grams. On a side note, I also noticed that reduced fat/reduced calorie etc foods have lots of sugar. Early on in my quest to change my eating habits I decided to avoid any food that has been modified to make it reduced calorie, sugar, fat, etc. I am not focusing on these foods since I avoid them but I found an interesting article that reveals that these type of food often have (sometimes disturbing) higher sugar levels than their original counterparts. I also rely on food labels to tell me which ingredients are most abundant (ingredients are listed in order of their amount) but this may also be misleading. Manufacturers can divide their added sugar into different types (such as maltose, dextrose, etc) so each ‘type’ appears further down the list making it appear that the food has less added sugar (if consumers even know that these terms actually mean sugar). Today I continue my quest to change my eating habits. I initially did this to prepare for IVF, but I am starting to view this process as a lifelong change. Even so, one reason I decided to look at yogurt is because it is recommended by the Harvard Fertility Diet. There are so many benefits of eating yogurt. Yogurt is high in calcium, contains good bacteria that helps manage digestion and control yeast in the body, and can be high in protein. 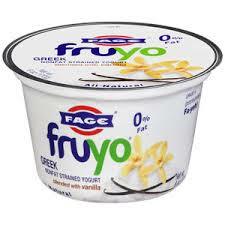 It can be difficult to find the best yogurt among the countless options at the grocery store. * Low in sugar. 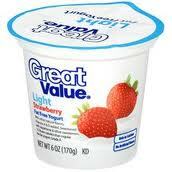 Plain yogurt does have the lowest sugar and I will use that to make smoothies. However, it is hard for me to eat it without adding a bunch of stuff to it. 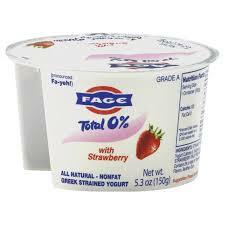 Later I may try to adapt to plain yogurt by initially adding a lot to it and tapering off. Right now, I will focus on vanilla or strawberry flavored yogurt. * Calories are not my primary concern but I will keep them in check. To start things off, this is what I used to get. 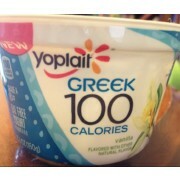 This yogurt has 80 calories, 12 grams of sugar, 5 grams of sugar, contains aspartame, and is highly processed. Check out the ingredients: cultured grade a nonfat milk, water, cherries, fructose, modified food starch, contains less than 1% of modified corn starch, kosher gelatin, natural and artificial flavors, aspartame, malic acid, potassium sorbate, acesulfame potassium, sodium citrate, sucralose, vitamin a palmitate, vitamin d3, red 40, caramel color, blue 1, active cultures. Yikes! It is time to look for other options. 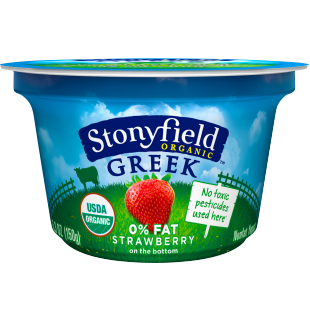 While I have dismissed Greek yogurt as a fad in the past, I decided to make the switch after reading about the multitude of benefits including higher levels of protein. 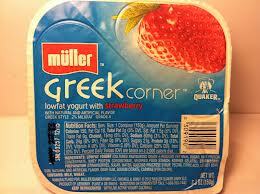 After trying it, I realized I also prefer its creamier constancy to traditional yogurt. Next, I looked at a few popular options. Calories: 100, Sugar: 7, Protein: 13. Ingredients: cultured pasteurized grade a nonfat milk, water, sugar, contains 2% or less of: corn starch, natural flavor, lemon juice concentrate, sucralose, acesulfame potassium, vitamin a acetate, vitamin d3. This brand is highly processed and contains artificial sweeteners. Ingredients: cultured pasteurized nonfat milk, evaporated cane juice, natural vanilla flavor, locust bean gum, pectin, live and active cultures. Ingredients: Nonfat Yogurt (Cultured Pasteurized Nonfat Milk), Live and Active Cultures: S. Thermophilus, L. Bulgaricus, L. Acidophilus, Bifidus and L. Casei, Strawberries, Evaporated Cane Juice, Pectin, Natural Flavors, Locust Bean Gum, Fruit and Vegetable Juice Concentrate (For Color). Ingredients: Cultured Grade A Non Fat Milk, Water, Sugar, Fructose, Modified Corn Starch, Contains Less than 1% of Natural Vanilla Flavor, Malic Acid, Potassium Sorbate (to Maintain Freshness), Sodium Citrate, Vitamin D3. This brand is highly processed. I’m gonna pass. 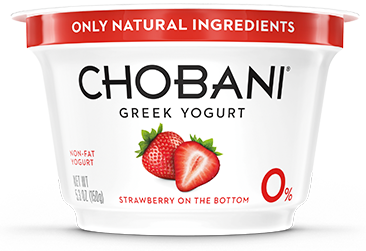 Ingredients: STRAINED YOGURT [ Grade A Pasteurized Skimmed Milk, Live Active Yogurt Cultures (L. Bulgaricus, S. Thermophilus, L. Acidophilus, Bifidus, L. Casei)], Cane Sugar, Water, Corn Starch, Pectin,Natural Vanilla Flavor, Ground Vanilla Beans, Lemon Juice Concentrate. Next up is their strawberry flavor. Ingredients: STRAINED YOGURT: Grade A Pasteurized Skimmed Milk, Live Active Yogurt Cultures (L. Bulgaricus, S. Thermophilus, L. Acidophilus, Bifidus, L. Casei). STRAWBERRY FRUIT PREPARATION (20%): Strawberries, Cane Sugar, Water, Corn Starch, Contains 2% or less of: Strawberry Juice Concentrate, Lemon Juice Concentrate, Natural Flavors, Xanthan Gum. Ingredients: lowfat yogurt (cultured pasteurized grade a nonfat milk, sugar, milk protein concentrate, whey protein concentrate, kosher gelatin, modified food starch), strawberries preparation (strawberries, sugar, water, glucose-fructose syrup, pectin, citric acid, locust bean gum, natural and artificial flavor, guar gum, sodium citrate, carmine). This looks good. Let’s look at the strawberry flavored version. 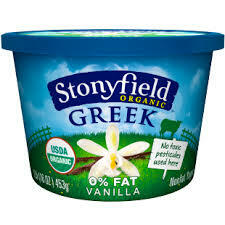 I decided to get Stonyfield Organic Greek Vanilla yogurt. 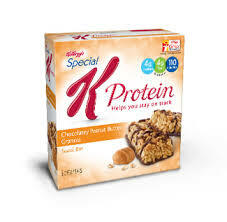 The sugar is low, it is minimally processed, it has a decent amount of protein, and lots of good bacteria. It is a little expensive but thankfully, you can create an account on their website and get some good coupons. I also found that it is cheaper at Harris Teeter vs. Whole Foods and Harris Teeter sometimes puts it on sale. All of this was just my preliminary research. I have said before that I am by no means an expert on nutrition and I do value input. 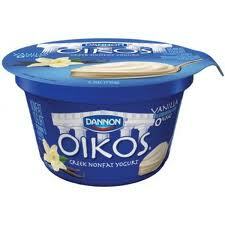 Please feel free to share thoughts on these or any other brands of Greek yogurt. It is difficult to choose among all the options! So cheese is one of my favorite foods. Nothing is more comforting then curling up with a grilled cheese (and maybe some tomato soup) especially when it is rainy or cold outside Cheese is not something I will ever give up so I wanted to learn how it may impact my fertility and overall health. Here is what I found. It looks like avoiding soft cheese may be a good idea (especially if I ever do become pregnant). While I have never taken a pregnancy test, I think there may have been times I was pregnant and lost it very early. 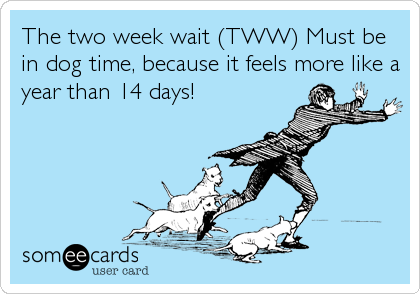 My cycle is usually like a clock but a few times I was a week late and felt several pregnancy symptoms. Even though I love cheese, I rarely eat soft versions so for me this will not be to difficult to avoid. There are other foods on this list that I plan to deal with later. While information sources do not always agree, many claim that for women, cheese is ok for fertility. Some sources recommend it due to its calcium (of course in moderation!). Other sources state that it can aggravate conditions such as PCOS and Endometrosis. I have unexplained infertility and testing indicates these conditions are not an issue for me. I did learn that cheese may impact male fertility. Men who eat 3+ serving of full fat dairy may have poorer quality sperm (You can read more about this here and here. Lucky for me, my DH is not big on dairy. He has also had several tests which indicate his swimmers are super healthy. I know that these tests do not tell you everything but this is still good news. As I have said before, one of my health goals is to cut out processed food by paying attention to food labels and ingredients. I took a look at a few of the cheeses I sometimes buy. 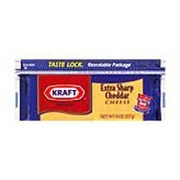 Vermont White Cheddar Cheese (Pasteurized Nonfat Milk and Milkfat, Cheese Culture, Salt, Enzymes), Sharp Cheddar Cheese (Pasteurized Nonfat Milk and Milkfat, Cheese Culture, Salt, Enzymes, Annatto [Color]), Mild Cheddar Cheese (Pasteurized Nonfat Milk and Milkfat, Cheese Culture, Salt, Enzymes, Annatto [Color]), Potato Starch, Cellulose Powder, and Calcium Sulfate Added to Prevent Caking, Natamycin (a Natural Mold Inhibitor). Annatto: This is a seed or extract primarily used to give cheese its yellow/orange color (apparently, cheese is not naturally bring yellow/orange). The FDA states that certification of this food additive is not necessary to protect public health. Some sources suggest that there may be issues with annatto but overall, it does not look that bad. Even so, I do like to avoid food dye and additives when I can. Cellulose Powder: health.com states that cellulose is derived mainly from wood pulp and cotton, is used in paper ­manufacturing—and sometimes added to food. Humans can’t digest it(this does not mean it harms us). The FDA says it is safe but I am thinking this may not be the best thing to consume if my goal is to focus on avoiding processed foods. Natamycin: This is also used to treat fungal eye infections. It has a C rating for pregnancy which simply means that one can not rule out a risk (it does not mean that it is dangerous for sure). 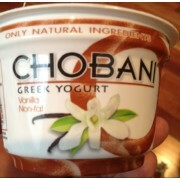 The European Food Safety Authority also says it is safe to consume and I could not find any FDA warnings. One concern I did find is that it can lead to antibiotic resistance. 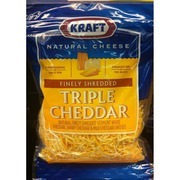 I often use sliced cheese to make sandwiches. This helps me with portion and calorie control. While those are not my primary health concerns, it is good to keep them in check. Using a slice prevents helps me control my serving. 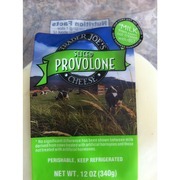 One cheese I like is Trader Joe’s sliced provolone. It has a 100 calories per slice. According to Fooducate, here is the list of the ingredients: pasteurized milk, cheese cultures, animal rennet, salt. Animal Rennet: Rennet is a complex of enzymes found in the stomach of baby mammals that allows them to process mother’s milk (consumethisfirst.com). 1. 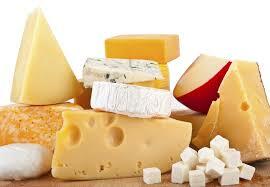 Cheese has been manufactured using rennet for thousands of years, mostly in Europe. 2. Indeed, rennet is extracted from the lining of the inside of the stomach of mammals, and most commonly from the fourth stomach of young calves. 3. Rennet contains enzymes that cause milk to become cheese, by separating it into the solid curds and the liquid whey. 4. Different animal rennet are used as well to create other types of cheese. 5. Most cheese in the US is NOT manufactured using rennet, mostly due to the availability of cheaper alternatives. 6. Vegetable rennet is made from certain vegetables that have coagulation properties as well. Thistle is the most common form. 7. Microbial rennet is derived from molds. Yum. A side effect is a slightly bitter tasting cheese. 8. Genetically engineered rennet is derived from plants that have been injected with cow genes. 9. Companies are not legally required to disclose the source of the rennet, so unless the product specifically states a non-animal source for rennet, you won’t know. 10. Another way to verify that the rennet is not from an animal source is to look for a kosher symbol. According to Jewish dietary laws, milk and meat ingredients cannot be mixed or eaten at the same time. Overall, animal rennet does not look awful and may be hard to identify. It does though have a pretty big ick factor. If I had a choice, I would choose cheeses that did not contain it. Ingredients: Cheddar Cheese (Pasteurized Nonfat Milk and Milkfat, Cheese Culture, Salt, Enzymes, Annatto (Color)), Natamycin (a Natural Mold Inhibitor). Ingredients: cultured pasteurized milk, salt, enzymes, annatto. 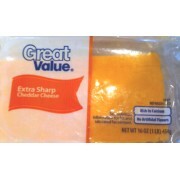 Cheese from Walmart actually looks better. Even so, for many reasons, I am trying to shop less at Walmart. Next I looked into other options. HOORAY! It has no dyes (annatto) and specifically states that it has no animal rennett! For some reason though, I had a hard time accepting that it is not yellow/orange. I don’t know why this was an issue but it was. After trying it, my concern subsided. It is delicious! It is also not crazy expensive. An 8 oz block at Harris Teeter (a common grocery store in my area) costs $3.49, Kraft costs $3.89, and Harris Teeter store brand costs $3.19. 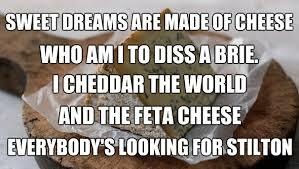 Of course this is not the only cheese I will ever eat. Even so, I now have a lot of information I can use when buying one of my favorite foods.